Happy Hour: 5:00 -7:00 P.M. Monday through Friday. This is one of those place we would probably not patronize were it not for happy hour. Everyone knows Emeril Lagasse. You know you’re getting quality here – and paying for it. Hence – happy hour. 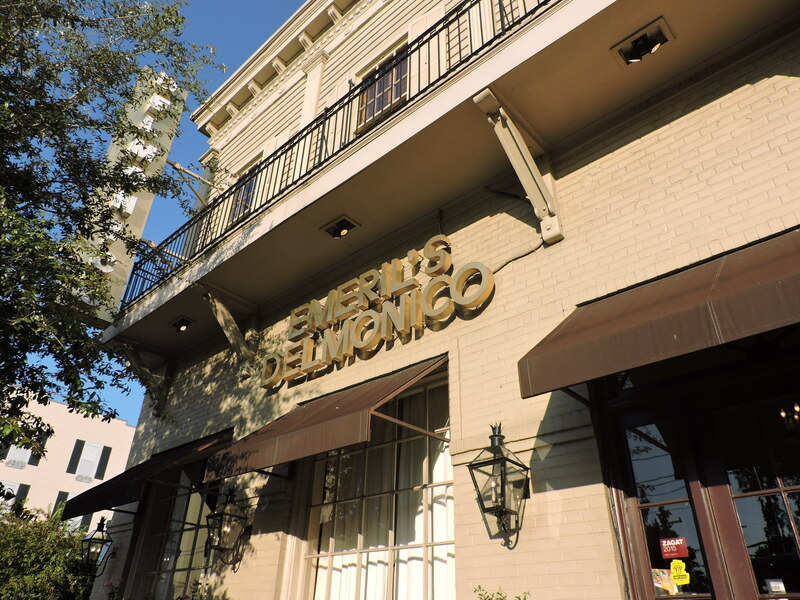 Located near Lee Circle on St. Charles, it’s easily accessible by streetcar. The interior is just as beautiful as the restored exterior. Once again, we were greeted by a friendly hostess. If an establishment can’t get this right, everything else is suspect. 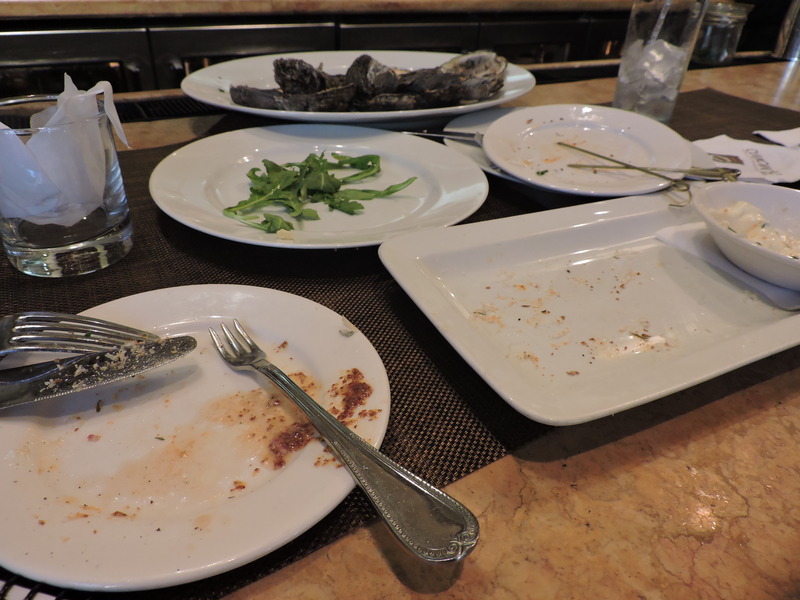 As it was only 5:00 P.M., the restaurant was virtually empty. We generally gravitate towards the bar as opposed to a table. We’re just more comfortable there, and we – and by we, I mean Nancy – do enjoy engaging the bartender. It’s a small bar with only six seats. Considering the layout of the rest of the place, it’s understandable that most people will sit at a table.The grand piano only adds to the gravitas. The bartender – whom we later came to know as Markos – poured us some water and handed us menus. As for the atmosphere, the volume level of the music was perfect, which was traditional blues, including legends like Howlin’ Wolf and Muddy Waters. The interior was unassuming beige and other muted neutral colors. While they have a fairly extensive beer selection, there was nothing on tap. As for the wine, we don’t claim to be well-versed enough to make an objective critique. Suffice it to say, it’s safe to assume this place will satisfy the most discerning of wine consumers. Ultimately, we decided on mixed drinks. Having come to appreciate a fine Sazerac, I decided to try my luck here. It was better than most I’ve had in town. Some bartenders make it too boozy or too sweet. Markos got it right. Nancy enjoyed a Pimm’s Cup for the first round, and one of the specialty cocktails for the second. 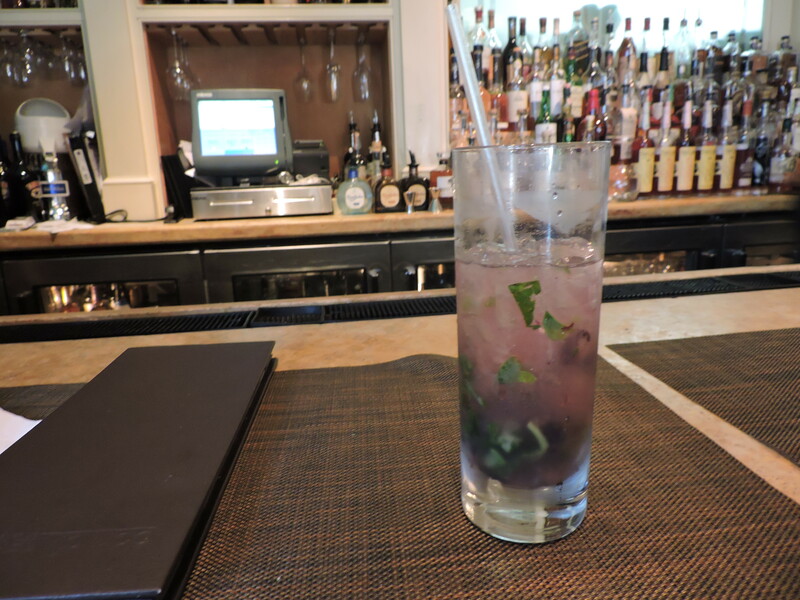 It was called a “Rice, Rice, B.B.”, which consisted of Oryza vodka, blueberries, basil, and lemon. She enjoyed it as much as I enjoyed the Sazerac. 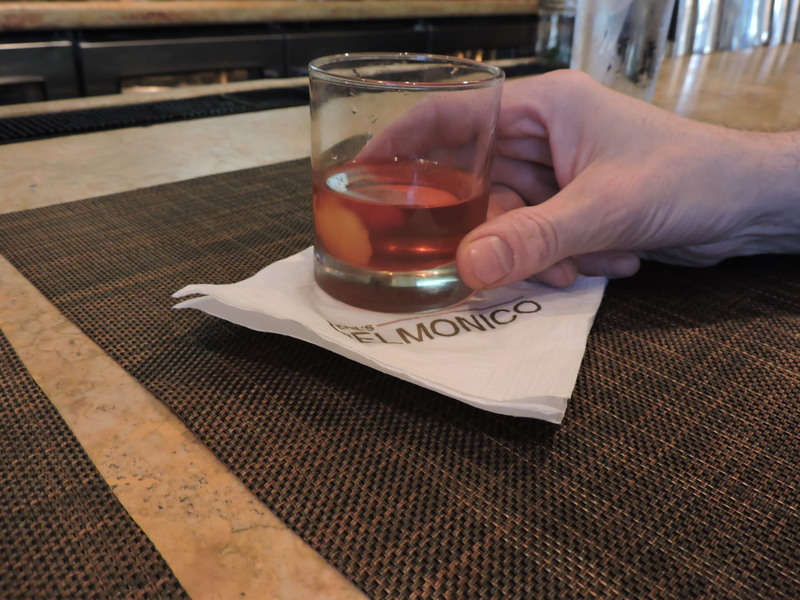 For the record, happy hour prices on drinks include half off all beer, wine by the glass, and mixed drinks. Best Sazerac in recent memory. Only 11??? Nancy found a double. It was a dozen after all. 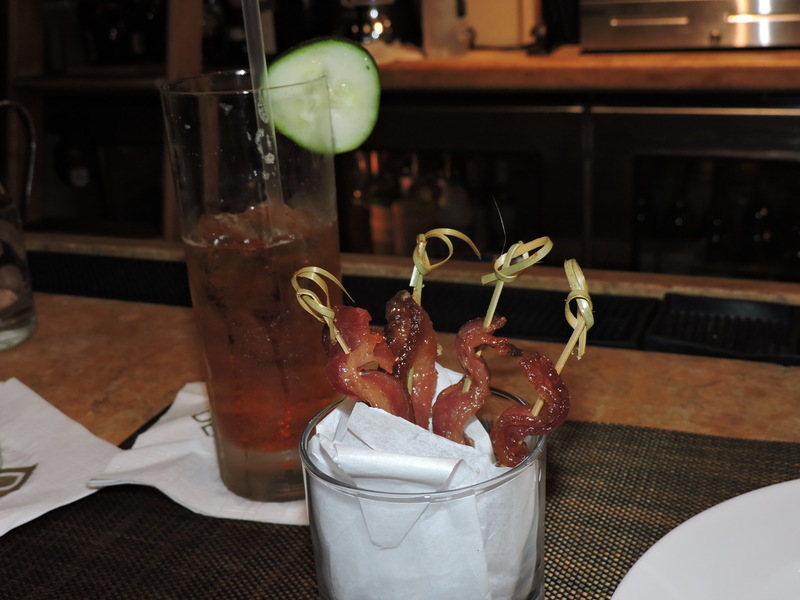 Candied bacon and Pimm’s Cup. Small plates. Some smaller than others. Overall, we certainly enjoyed the drinks, and will return for the Sazerac and other specialty cocktails. 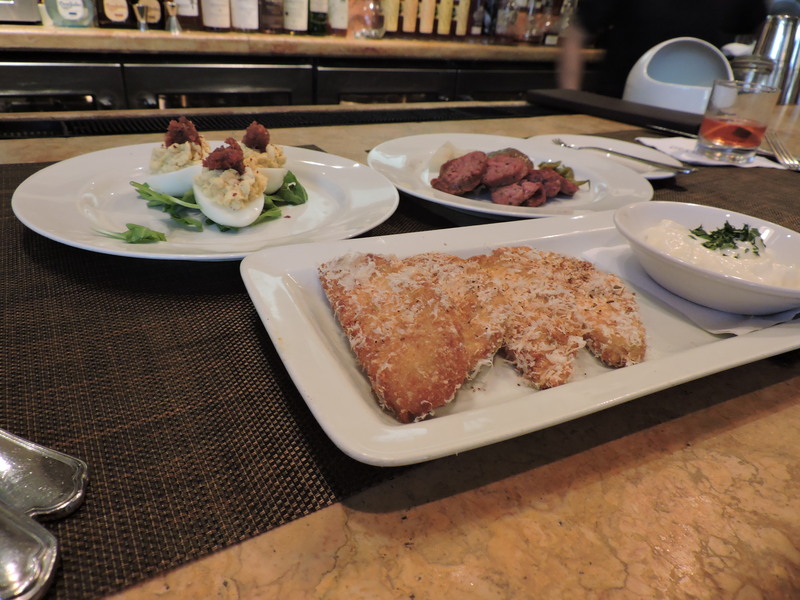 As we mentioned in the introductory post, the main goal of going to happy hour is frankly – dinner. 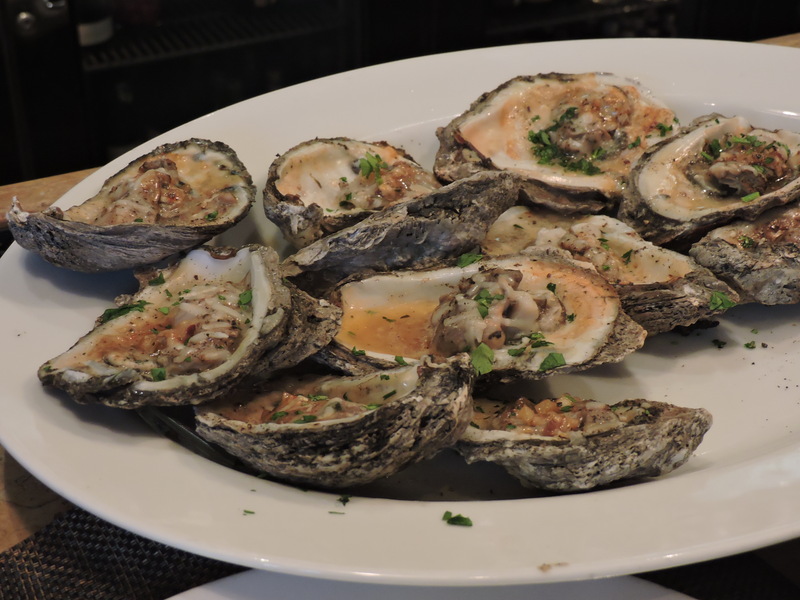 After the oysters and small plates, we realized we were still hungry, so we hit up another happy hour – to be reviewed later. 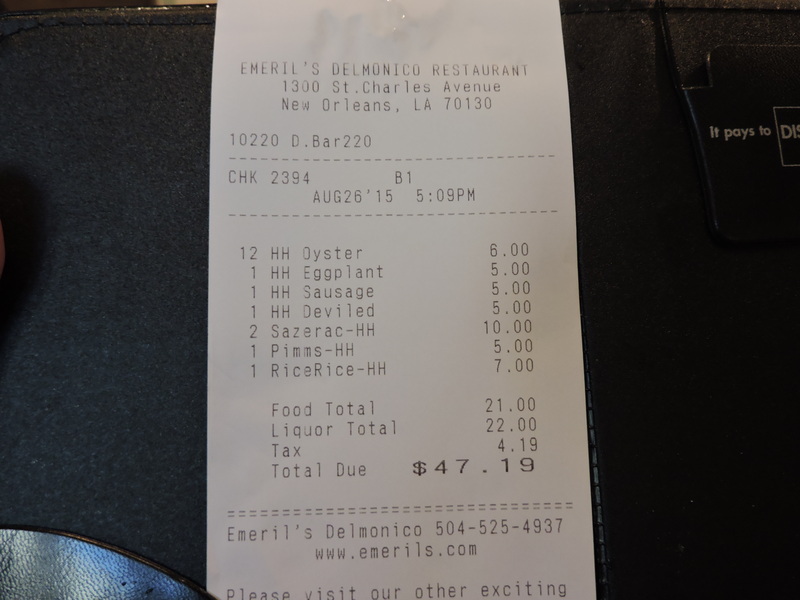 Oddly enough, we encountered another patron from Delmonico at happy hour number two. Nancy intended to connect with her, but she slammed her campy cocktail and cheap eats before taking off. Probably a booze hound, but what does that say about us?